E44000 Series' non-thermal hurricane-impact storefront's aluminum can be extruded using EcoLuminum, a high recycled-content aluminum billet composition with eco-friendly, durable finishes. 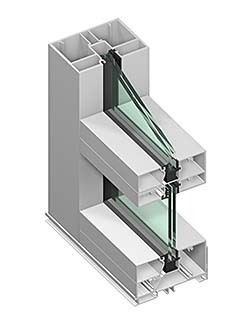 The storefront is a 2.5-by-5-inch flush-glazed, system for use on first floor, single-span applications in impact areas. The screw-spline framing is prepared for glazing with 9/16-inch laminated glass positioned in the center of the frame.